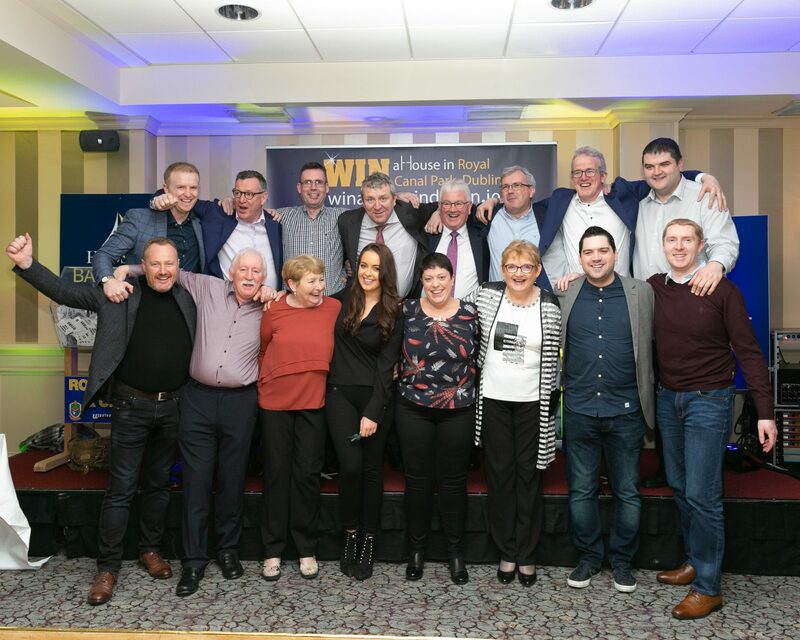 The Club Rossie team alongside county board officials that made the Win a House in Dublin draw into the most successful fundraiser in the history of Roscommon GAA. It’s still scarcely believable. But anything is possible when a highly professional group of people put their heads together and deliver — all in the name of something they love. For David Leydon, a member of the Club Rossie team, it became an obsession. The Win a House in Dublin draw was launched on September 11th. By the time Roscommon senior football manager Anthony Cunningham pulled Kumar Gangah’s name from the drum containing 14,034 tickets on December 30th, Roscommon GAA had raised €1,403,000 and netted a profit of €943,400 — that’s €12,643 per day or €527 per hour over 111 days. “We were consumed by it. We had a highly motivated and professional team who believed that anything was possible. We set ourselves a target of 10,000 tickets. That would have netted around €550,000, which would have been excellent. To do what we did, I think it tells you everything you need to know about the group of people that delivered this,” he explained. Leydon, like the rest of the Club Rossie crew, has an unquenchable love for Roscommon GAA. But his professional background in agriculture and business, not to mention his acumen when it comes to digital technology, was put to good use when it came to stitching the mechanics for Club Rossie’s most successful fundraiser together. “I suppose the thing to remember about the group of people behind this is that a lot of us have soldiered together since 2013 when Club Rossie was launched. It was a tried and tested group of individuals that had developed a solid way of working with each other. Of course, we recruited some new people along the way, but every team needs that to generate fresh ideas and perspective,” he pointed out. The “Win a House” concept was the brainchild of Roscommon County Board Treasurer and former Club Rossie Chairperson David O’Connor. After meeting with Ballymore’s Seán Mulryan at the end of July, plans were hatched to set the wheels in motion for the top prize of a three-bedroomed house in Royal Canal Park, Ashtown, Dublin 15, worth €425,000. “There were a lot of things to get right initially — the sales and marketing strategy, the legal side of things and the controls required. Because of the finance involved, the proper controls were critical. People had to see that this was being run in a professional way. “The PR we received in the first week was crucial. The Irish Times, the Indo, The Examiner, all the tabloids and online platforms rowed in behind us. Locally, the story was carried on the front page of the Roscommon Herald. Then David O’Connor did an interview with Dermot and Dave on Today FM, which really did give us a great platform nationally. In the first week alone, we sold 2,000 tickets,” David recalled. Between the cost of the house (€350,000), stamp duty, legal and advertising costs, trying to claw back a figure of over €400,000 immediately sharpened minds. “Of course there was pressure. I mean you’re down that amount straight away, so focus was paramount. But our strategy was key. We had a great product with widespread interest. At all times, we had to focus on the house, and not on Club Rossie or Roscommon GAA. “The investment in digital technology was another hugely important tool. We sold 11,800 tickets (84 per cent) online. Then we had to build up trust with a cohort of people outside Roscommon. As the campaign unfolded, getting bodies out on the ground to places of interest yielded a rich harvest as Pat Compton (Club Rossie Chairperson), Aidan Brady (Project Manager) and their team visited Liffey Valley Shopping Centre; The Pavilions, Swords; Whitewater Shopping Centre, Newbridge; Athlone Town Centre, Casey’s, Roscommon, and AIB and Bank of Ireland, Roscommon. Digital advertising played its part too, with train stations in Connolly, Heuston and Pearse, alongside Applegreen and the IFSC (International Finances Services Centre) awash with information about the draw. Communication between the team was paramount and weekly conference calls every Wednesday alongside group meeting every month provided clarity on the draw’s progress. The team also received a message every evening via WhatsApp regarding ticket sales that day. Strategically, there were incentives dotted throughout the draw, with the “win five extra tickets” and Christmas Eve offers, and the Win a House in Dublin Day on December 12th proving to be extremely popular. As a result, Club Rossie was in a position to present €10,000 to its charity partner, the Mayo/Roscommon Hospice. “You always have a final week frenzy with any draw but this was beyond expectations. I think you had people that always meant to buy a ticket but they put it on the long finger before realising that the draw was coming up. “We ended up raising €330,000 in the last week alone, including selling 2,000 tickets on the weekend of the draw. It was phenomenal really,” highlighted David. Kumar Gangah from Lucan won the house, and it’s fair to say that the prize has changed his life. “He couldn’t believe it. When Aidan (Brady) rang Kumar with the good news, he was crying on the other end of the phone. He works as a waiter in the one of the hotels around Liffey Valley. He picked up a leaflet about the draw in the shopping centre, saw the advert in The Star a week later and went online and bought a ticket. In a nutshell, that’s how the draw reached out to people,” remarked David. Life has slowly returned to normal. David admits that every last ounce of energy he had was ploughed into the draw. But the result has been well worth it, with the funds earmarked for the Dermot Earley Centre of Excellence in Runnabracken and the development of Dr. Hyde Park. “The draw’s timeframe was relatively short, so I think everyone decided to give it everything they had into it to see where it would take us. We had a committee where everyone was putting their hand up to take on a job. It really did become everyone’s pet project. “But we were getting constant feedback. When the WhatsApp message came in at 9 p.m. every evening, you asked yourself ‘how did we do today and what can we do tomorrow’? “Realising how well we had done, everyone was on a high on the night of the draw, knowing this would make such a difference to Roscommon GAA going forward. “Anyone who met me over those couple of months, all I talked to them about was the draw. We became fixated with it. But there was a never a cross word between any of the committee. As volunteers, something like this should add to your life’s experiences, and we did enjoy it,” he revealed. And so to the burning question — could Club Rossie ever replicate the success of the Win a House in Dublin draw in the future? “We’re meeting on January 22nd (tonight) and we’ll be making a big decision on what the plan is going forward. Now that we’ve done it, people will inevitably ask the question, can we do it again? “What I would say is that we’ve been very encouraged by the positivity since the draw. Other counties are wondering how we managed it? Maybe we’ve put ourselves up on a pedestal. But, knowing the team like I do, I don’t see their appetite diminishing. “We’ll obviously have to refresh things a small bit and come up with a new range of ideas. But I would imagine that everyone will be up for the challenge, and we’ll see where that takes us,” he concluded. Somewhere few counties can only dream of, no doubt.